What does a shower cost in South Africa? 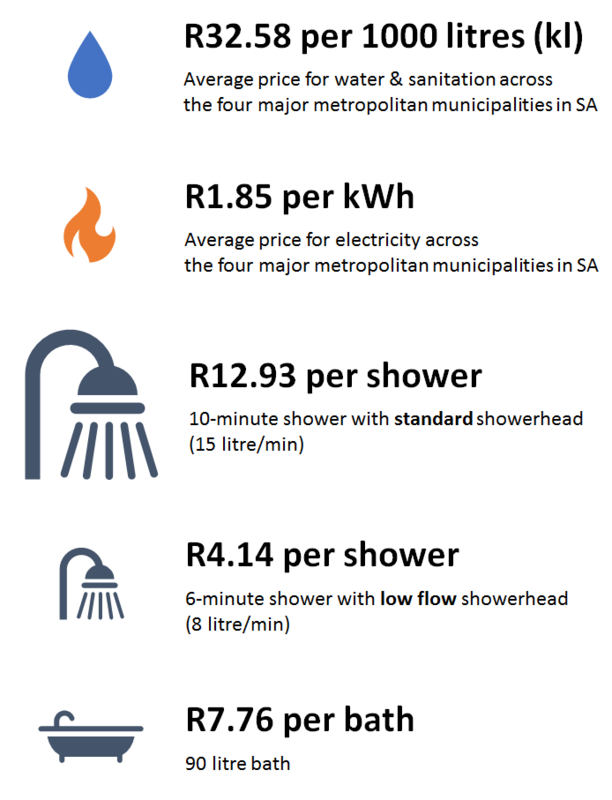 With the rapid increase in the price of electricity and water over the past few years, the question is: what does a shower or bath cost in South Africa in 2017? Most South Africans are aware of the rapidly rising price of electricity (a 300% increase in the period 2007-2015 alone), but the price of water has also been increasing rapidly over the past few years. These increases are all much higher than inflation. All these municipalities have also done away with the free water allocation of 6 000 litres (6 kilolitres), except for people registered as indigent. Of course, there is a serious drought in Cape Town, and so the increases seen there might be more justifiable. South Africans tend not to think twice about the cost of a shower or bath, since both electricity and water used to be very inexpensive. Is this still true in 2017? We did some calculations and the result is an eye-opener. 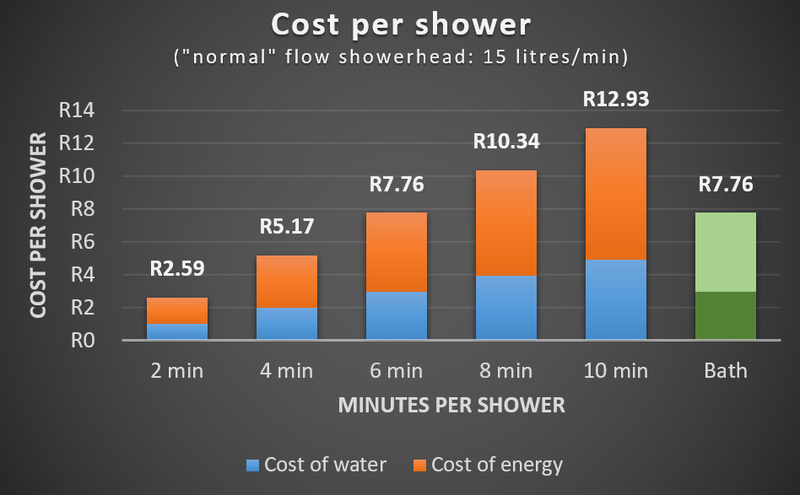 For an average middle-class household in South Africa (LSM7-10), a 10-min shower costs almost R13 if you have a ‘standard’ 15 litre/min showerhead! This is about R1.30/min. 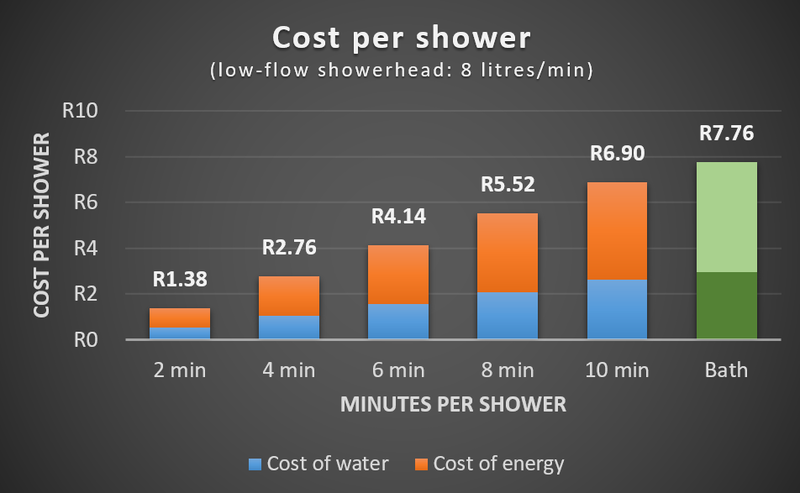 By changing to a low-flow showerhead and reducing shower time to 6 minutes, you can dramatically reduce this to just over R4 per shower (or 70c/min). In either case, it appears that the days of ‘cheap’ showers are numbered, and we can all do with being more aware of just how much water & electricity we use in the shower or bath. Conventional wisdom has it that showering uses less water than running a bath. 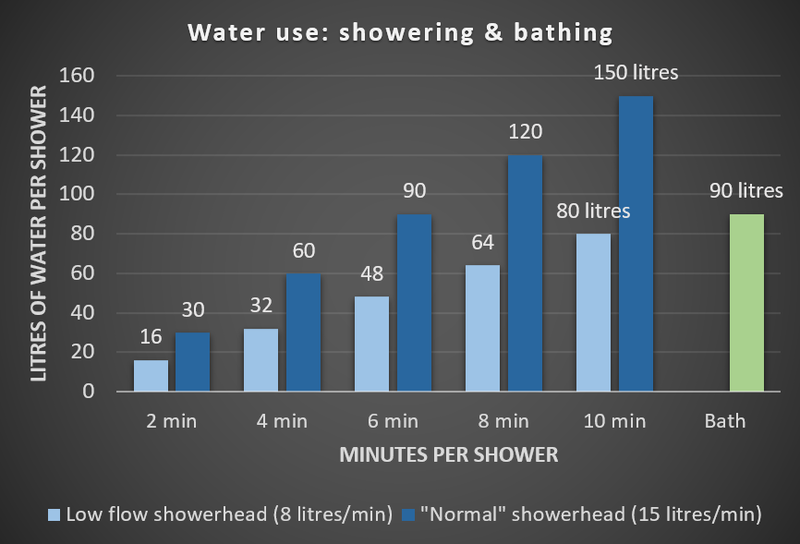 However, a typical bath uses 90 litres of water, so if you shower for longer than 6 minutes with a ‘standard’ showerhead, you will actually use more water than if you had a bath… With an average shower time internationally of 8 minutes, a shallow bath might actually be better for your pocket and the environment! Of course, even better than a shallow bath is to switch to a low flow showerhead and have shorter showers… City of Cape Town recommends showering for less than 2 minutes, and switching to low-flow showerheads (less than 10 litres/min) is compulsory according to City of Cape Town bylaws. 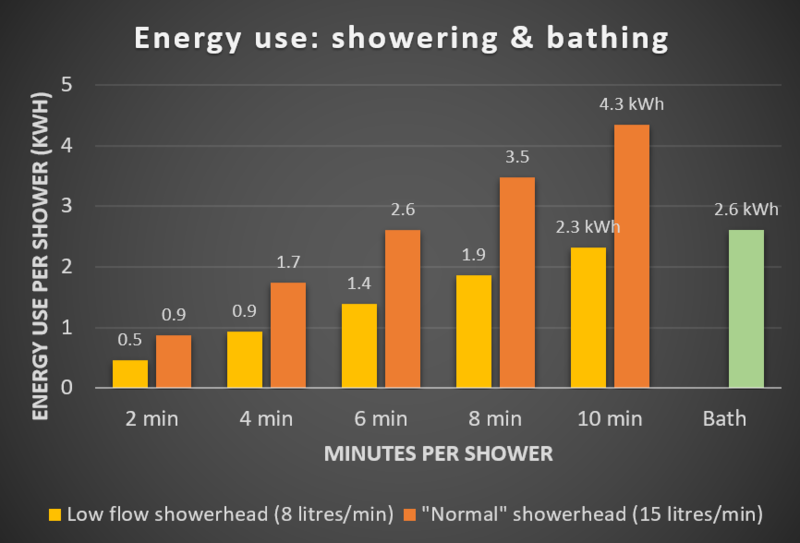 The graphs below show more detailed information on water & energy use and cost per shower for normal & low-flow showerheads, and compared to a ‘standard’ 90 litre bath. Shower & bath temperature of 40°C. See e.g. Lawrence JC & Bull JP. 1976. Thermal conditions which cause skin burns. Engineering in Medicine 5(3):61-63. Average residential water consumption data was obtained from: Viljoen N. 2016. Presentation: City of Cape Town Residential Water Consumption Trend Analysis 2014/15. Last accessed: 21/08/2017. Average residential electricity consumption data was obtained from: Goliger, A. and Cassim, A. (14 and 15 July 2017). Tipping Points: The Impacts of Rising Electricity Tariffs on Households and Household Electricity Demand. 3rd Annual Competition and Economic Regulation (ACER) 2017 Conference, Dar es Salaam, Tanzania. Last accessed: 21/08/2017. Average bath uses about 90 litres of water. Waterwise. Last accessed: 12/09/2017. “Normal” or standard showerheads use 15 litres of water per minute or more, and low flow showerheads use about 8 litres water per minute. Eskom fact sheet on showerheads. Last accessed: 12/09/2017. Average effective residential water & electricity tariffs were calculated from the published 2017/18 tariffs of the following four metropolitan municipalities: City of Johannesburg, City of Tshwane, City of Cape Town and Ethekwini, using the average residential water and electricity consumption values for LSM7-10 obtained from the above references. For ‘lower income’ households, the average water & electricity tariffs are somewhat lower across the four municipalities (due to lower average consumption), at R1.65/kWh for electricity and R23.47/kilolitre for water & sanitation. This yields a cost per bath of R6.42, a cost per 10-minute ‘normal showerhead’ shower of R10.70/shower, and a cost per 6-minute low-flow showerhead shower of R3.40/shower. Energy cost of hot water based on heating water from 15 to 60°C, which requires approximately 5.22 kWh per 100 litre. 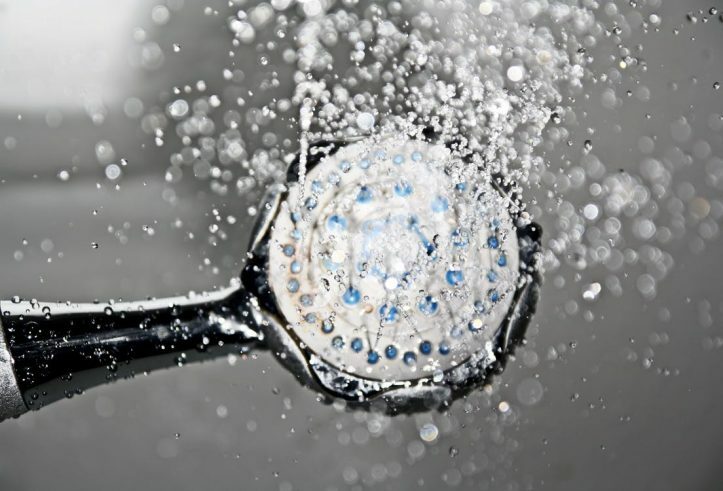 A study by the Alliance for Water Efficiency also found a shallow bath to be better than a long shower with a high flow showerhead. Average shower time: a recent study at a South African university found an average shower time of over 9 minutes.